We are Captain Skip & Toni Berry, a husband and wife team that share a love of being on the water and fishing. We love being out on Lake Michigan and during the boating season we are usually on our boat, the TERMINATOR III. 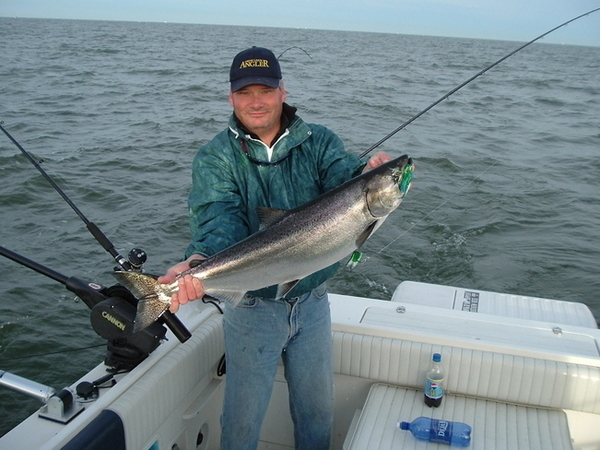 We travel to numerous salmon fishing tournaments every year and have fished 16 different ports up and down both shores of Lake Michigan for fun and competition. I grew up fishing with my father on inland lakes and rivers and also on my father's Lake Michigan charter boat. My first Lake Michigan fishing trip was in 1970 out of Pentwater, Michigan at age 10. I have been chasing the big water's trout and salmon ever since. I now have over 42 years of Lake Michigan trolling experience. In the winter, I continue to chase fish in warmer climates such as Florida and Mexico. My passions are trolling for billfish or tuna and bottom fishing on the wrecks or reefs for Snapper, Grouper and Amberjack." Toni has always loved being near the water and had made her home on the shores of the Muskegon River near Big Rapids, Michigan before we met. After we met, she discovered how much she liked being out on Lake Michigan and quickly picked up the love of chasing fish on the big water. She has shown her ability to fish with anybody, piloting our boat during fishing tournaments up and down the Michigan & Wisconsin coastlines. She is my partner in every sense of the word. We both truly love seeing other people experience the feeling of a King Salmon tearing off line on a surging run or the fantastic leaps of a lake run Rainbow Trout known as "Steelhead". Sharing the ever changing challenge of catching Lake Michigan's gamefish is what it is all about for us. We charter because we love it not for the money. Nothing in the Great Lakes is better than being there for someone's first battle with a big salmon or trout! To us, our customers are our FRIENDS, not a statistic! !